M-ORBIS is a Molecular Cartography approach that performs integrative high-throughput analysis of structural data to localize all types of binding sites and associated partners by homology and to characterize their properties and behaviors in a systemic way. 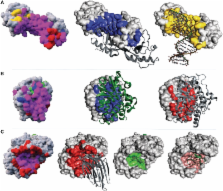 The robustness of our binding site inferences was compared to four curated datasets corresponding to protein heterodimers and homodimers and protein–DNA/RNA assemblies. The Molecular Cartographies of structurally well-detailed proteins shows that 44% of their surfaces interact with non-solvent partners. Residue contact frequencies with water suggest that ∼86% of their surfaces are transiently solvated, whereas only 15% are specifically solvated. Our analysis also reveals the existence of two major binding site families: specific binding sites which can only bind one type of molecule (protein, DNA, RNA, etc.) and polyvalent binding sites that can bind several distinct types of molecule. Specific homodimer binding sites are for instance nearly twice as hydrophobic than previously described and more closely resemble the protein core, while polyvalent binding sites able to form homo and heterodimers more closely resemble the surfaces involved in crystal packing. Similarly, the regions able to bind DNA and to alternatively form homodimers, are more hydrophobic and less polar than previously described DNA binding sites. Methods for alignment of protein sequences typically measure similarity by using a substitution matrix with scores for all possible exchanges of one amino acid with another. The most widely used matrices are based on the Dayhoff model of evolutionary rates. Using a different approach, we have derived substitution matrices from about 2000 blocks of aligned sequence segments characterizing more than 500 groups of related proteins. This led to marked improvements in alignments and in searches using queries from each of the groups. The Universal Protein Resource (UniProt) provides the scientific community with a single, centralized, authoritative resource for protein sequences and functional information. Formed by uniting the Swiss-Prot, TrEMBL and PIR protein database activities, the UniProt consortium produces three layers of protein sequence databases: the UniProt Archive (UniParc), the UniProt Knowledgebase (UniProt) and the UniProt Reference (UniRef) databases. The UniProt Knowledgebase is a comprehensive, fully classified, richly and accurately annotated protein sequence knowledgebase with extensive cross-references. This centrepiece consists of two sections: UniProt/Swiss-Prot, with fully, manually curated entries; and UniProt/TrEMBL, enriched with automated classification and annotation. During 2004, tens of thousands of Knowledgebase records got manually annotated or updated; we introduced a new comment line topic: TOXIC DOSE to store information on the acute toxicity of a toxin; the UniProt keyword list got augmented by additional keywords; we improved the documentation of the keywords and are continuously overhauling and standardizing the annotation of post-translational modifications. Furthermore, we introduced a new documentation file of the strains and their synonyms. Many new database cross-references were introduced and we started to make use of Digital Object Identifiers. We also achieved in collaboration with the Macromolecular Structure Database group at EBI an improved integration with structural databases by residue level mapping of sequences from the Protein Data Bank entries onto corresponding UniProt entries. For convenient sequence searches we provide the UniRef non-redundant sequence databases. The comprehensive UniParc database stores the complete body of publicly available protein sequence data. The UniProt databases can be accessed online (http://www.uniprot.org) or downloaded in several formats (ftp://ftp.uniprot.org/pub). New releases are published every two weeks. Molecular characterization of a new immunoglobulin superfamily protein with potential roles in opioid binding and cell contact. Low-molecular-weight tumor necrosis factor receptor p55 controls induction of autoimmune heart disease. A new high molecular weight immunoglobulin class from the carcharhine shark: implications for the properties of the primordial immunoglobulin.